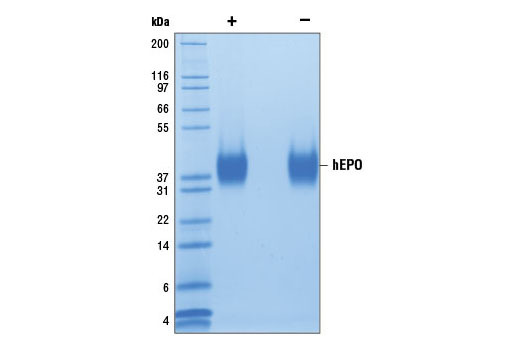 The purity of recombinant hEPO was determined by SDS-PAGE of 6 µg reduced (+) and non-reduced (-) recombinant hEPO and staining overnight with Coomassie Blue. The proliferation of TF-1 cells treated with increasing concentrations of hEPO was assessed. After 48 hour treatment with hEPO, cells were incubated with a tetrazolium salt and the OD450 - OD650 was determined. Recombinant human Erythropoietin (hEPO) Ala28-Arg193 (Accession #NP_000790) was expressed in human 293 cells at Cell Signaling Technology. >98% as determined by SDS-PAGE of 6 μg reduced (+) and non-reduced (-) recombinant hEPO. All lots are greater than 98% pure. Recombinant hEPO contains no "tags" and the nonglycosylated protein has a calculated MW of 20,417. DTT-reduced and non-reduced protein migrate as 34-40 kDa polypeptides. Lower mobility in SDS-PAGE is due to glycosylation. The expected amino-terminal APPRL of recombinant hEPO was verified by amino acid sequencing. The bioactivity of recombinant hEPO was determined in a TF-1 cell proliferation assay. The ED50 of each lot is between 50-400 pg/ml. Less than 0.01 ng endotoxin/1μg hEPO. With carrier: Lyophilized from a 0.22 μm filtered solution of PBS, pH 7.2 containing 20 μg BSA per 1 μg hEPO. Carrier free: Lyophilized from a 0.22 μm filtered solution of PBS, pH 7.2. 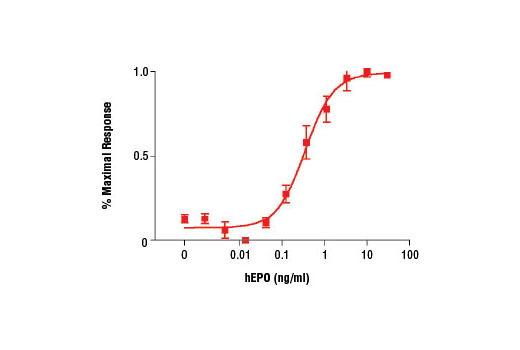 EPO is a 34 kDa protein that is required for the survival and terminal differentiation of erythrocytes (1). EPO is produced by a number of cell types including tubular endothelial cells, interstitial cells, hepatocytes, Kupffer cells, astrocytes, and Schwann cells (2-4). EPO inhibits apoptosis and may protect neuronal cells from death during ischemia and/or neurodegenerative diseases (3,4). EPO inhibits the production of pro-inflammatory cytokines through inhibition of NF-κB signaling (5). EPO protected against the development of diabetes in an animal model by promoting pancreatic β cell survival and growth (6). Binding of EPO to its cognate receptor, EPOR, induces activation of Jak2, Stat5 and Akt (3-5). Wu, H. et al. (1995) Cell 83, 59-67. Koury, S.T. et al. (1989) Blood 74, 645-51. Keswani, S.C. et al. (2011) Proc Natl Acad Sci U S A 108, 4986-90. Um, M. and Lodish, H.F. (2006) J Biol Chem 281, 5648-56. Nairz, M. et al. (2011) Immunity 34, 61-74. Choi, D. et al. (2010) J Exp Med 207, 2831-42. Guo, L. et al. (2014) Clin Exp Med 14, 69-76.